Scientists at James Cook University have been given $100,000 to study a fish endangered by its own beauty. Researchers at TropWater, JCU Dr Brendan Ebner and James Donaldson have spent the past six years cataloguing rare cling gobies in the Far North, mostly in their own time. Preliminary data suggests that nine of the ten species of goby in the area are very rare, and only now funds have become available for a comprehensive study. Dr Ebner said these fish live only in short, steep rainforest streams that flow directly into the ocean and face a number of threats. 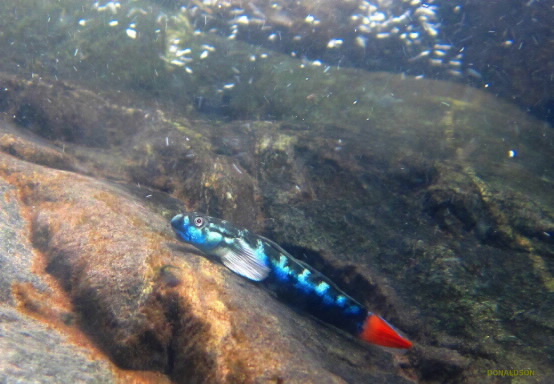 Recently the cling gobies were listed as no-take species under Queensland legislation. The pair of researchers has been mapping the fish on weekends, but with a grant from the Queensland Government they will now be able to measure water flows and develop a better understanding of priority streams, while also engaging local landholders. “We are going to feed our past data into a computer model and then it will inform where we go and survey in other Wet Tropics streams,” said Dr Ebner. He said cane toads were in plague proportion in some of these streams and their tadpoles ate the algae the cling gobies fed on. The study will take a year. Dr Ebner said the pair had been working with the Far North Queensland Regional Organisation of Councils and hoped their findings would be incorporated into efforts to protect freshwater biodiversity in the Wet Tropics region.